Les Clefs d’Or Canada’s 12th National Congress Banff was an opportunity of a lifetime. The congress brought together over 100 Les Clefs d’Or Concierges from coast to coast. The Majestic Fairmont Banff Springs hosted all of these professionals and the sponsors who made this congress possible. Les Clefs d’Or Alberta Region went above and beyond to give us the best experience. Every detail was covered from the moment we arrived at the airport and were greeted by our lovely concierge Jill Marven from the Fairmont Palliser Hotel who escorted us to the Banff Airporter. Upon arrival at the Fairmont Banff Springs, we were welcomed in our rooms with detailed welcome bags that contained information on the congress, gifts, treats, maple syrup, macaroons, fudge and a gift from Park Distillery. The week was filled with many unforgettable memories; the welcoming reception, educational sessions, Banff Gondola, outdoor activities, bowling at High Rollers, the Annual General Meeting and our Gala Night. We had the pleasure of connecting with many wonderful motivational speakers on Day 2 of our Educational breakout sessions. Elisabeth Fayt, an international inspirational speaker, bestselling author of the book “Paving it forward”, and Owner/Founder of the Canadian Spa RnR Wellness, located in two of Calgary’s premier downtown hotels; Fairmont Palliser and Le Germain Hotel Calgary. Connie DeSousa and John Jackson, co-chefs and co-owners of the Char Group in Calgary. Photo:__Bowmedia. One of the very exciting parts of the Banff 2019 National Congress was the educational day. We welcomed diverse types of speakers who engaged, elevated and educated us on various topics. The afternoon was a panel discussion on “Exploring the Changing Culinary Landscape”, mediated by Ms. Dawn Chubai. Among the distinguished speakers were John Jackson and Connie DeSousa, the co-owners and chefs at the Char Group in Calgary. 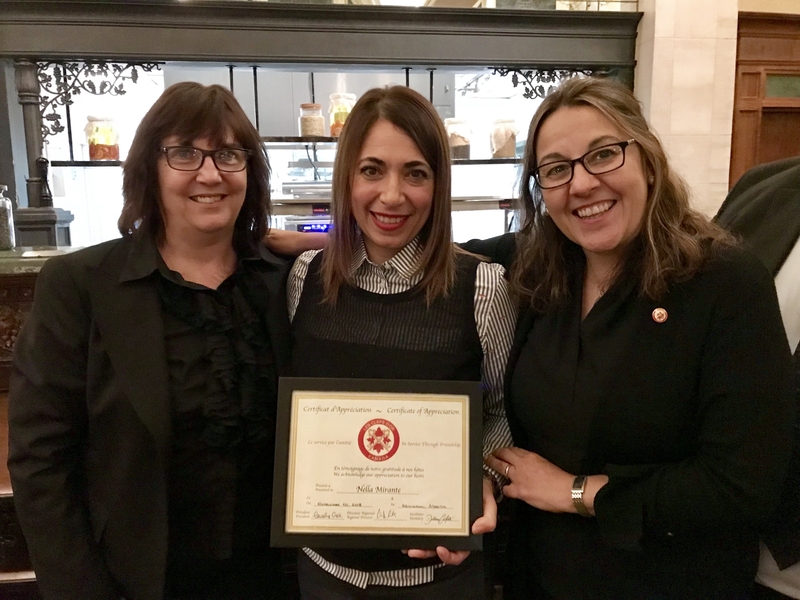 A certificate of appreciation was presented to Nella Mirante for her outstanding work in organizing our National Board Meeting in Edmonton. Cindy Stewart, Alberta Region’s Director, is on the left and Carolina Avaria, President, is on the right. A year in the planning! One year ago we discussed who could host the National Board meeting for 2018. I reached out to my regional board to see if they would support the idea of me hosting it at the Fairmont Hotel MacDonald and Don Mooney and Cindy Stewart gave me the go ahead! The Alberta Region’s Concierges and the Terry Fox Run 2018. This year we are celebrating the 38th anniversary of the Marathon of Hope. This event reminds us, as Terry Fox once said, “The importance of realizing that anything is possible, if you try. Dreams are made if people try.”Terry Fox battled cancer at the age of 18 years old. His dream was to raise $1 000 000 for cancer research and as he fought for his life at the age of 22, he earned many awards and was able to raise more than $10 000 000 in a special telethon. As per the official site $700,000,000 has been raised in Terry’s name for cancer research. Fort Calgary was the start and end of the “Marathon of Hope”. People could be seen coming from everywhere. Everyone enjoyed the cheerful atmosphere being entertained by stretching, activities, music and complimentary coffee from our friends at Tim Hortons. 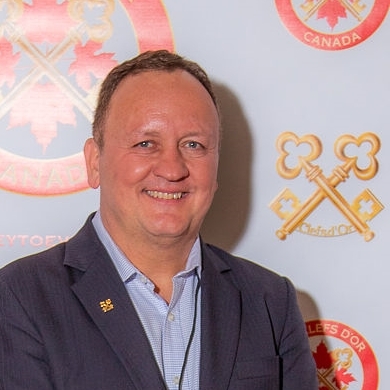 Crispin Bottomley, Honorary Member of Les Clefs d’Or Canada. Les Clefs d’Or Canada has a long standing tradition of service excellence. Our members are some of the best concierge in the hospitality industry. In the concierge business, the way you do your job is important, but also who you know can make a big difference. 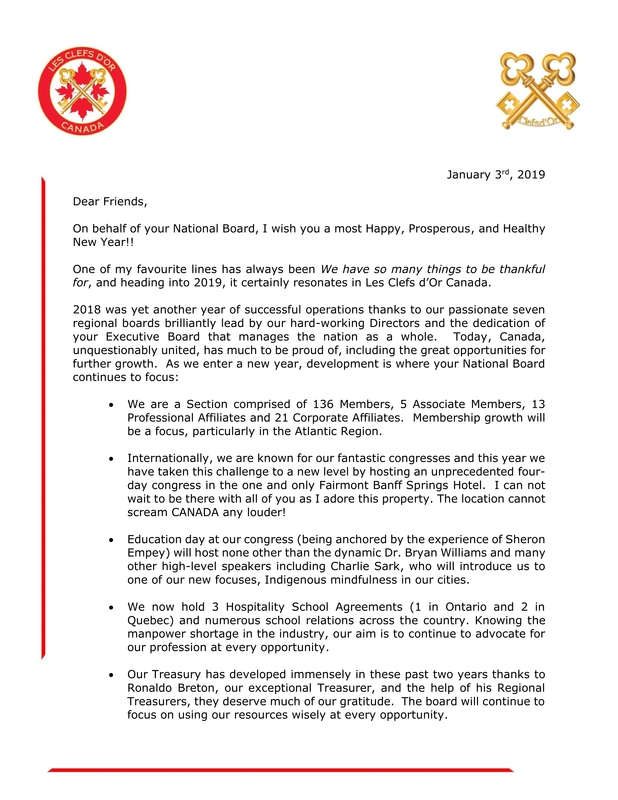 Announcement: The new BC Regional Board for 2019-21. The 2019-2021 BC Regional Board: Salima Jiwan, Yuki Fournier, Rodolfo Parra and Murray McMullen.